Seattle does get its fair share of miserable, wet cold days in a year, but the summers here are truly exceptional. Hot blue sky days, splendid sunsets, and the temperature at night cooling down just enough to let you sleep comfortably. This weekend has been particularly nice, except maybe for Noodle, slowed down by his fur coat; he has mostly been wanting to slowly move from one cold spot on the concrete floor to the next, jumping on the couch when he gets a little extra energy. I've used the excuse that it's too hot outside to bring him on long walks, and enjoyed the extra time. I'm completely immersed into summer mode, spending time outside, soaking up the sun, exercising, thinking of many projects and slowly not accomplishing anything worthy. I've actually been all over the place lately: shopping for a loom, starting jewelry making, taking a pottery class. I'm either unfocused or opening up my horizons. I'll let you be the judge. Either way, it's been extremely pleasant and relaxing, but I'm starting to get stressed out by self imposed deadlines, with wedding, housewarming, birthdays and baby shower coming up. I should be making more, sticking to a strict schedule, but it's summer, so instead I'll head to a patio, enjoy happy hour and when I get too much sun, go to the movies to cool down. Somehow over the last few months, I've impulse-bought many skeins of beautiful yarn, often without a project in mind. They are overflowing in a large basket, and I'm feeling guilty and torn between the need to start on all these gifts I want to make and the desire to use up the yarn I already have. If I'm being truly honest, I have no idea what to make with all these skeins, and so in the basket they stay. Last week, I just had to actually start something, and feel a little productive. Funny enough, it turned out not to be anything on my list, but instead a new facecloth. I'm pretty good at this procrastinating business. Oh well; at least it used up one of my stashed skeins. 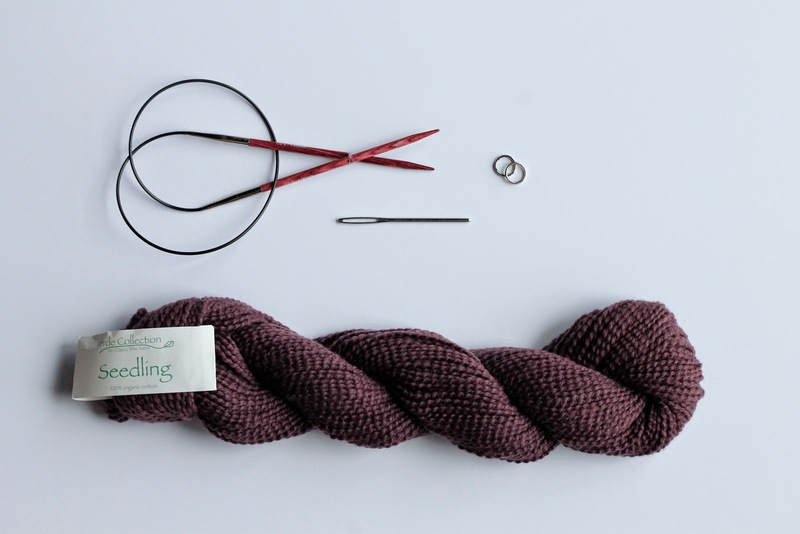 I picked this gorgeous plum skein of Seedling, from Classic Elite Yarns, made of 100% organic cotton. The colour is amazing, and it is super soft. I was a little less pleased when I had to wind the yarn, and not only was it quite tangled, but it also had 3 little knots, from where the yarn had been pieced together. Having to cut out the knot and weave in all those ends was not my idea of fun. 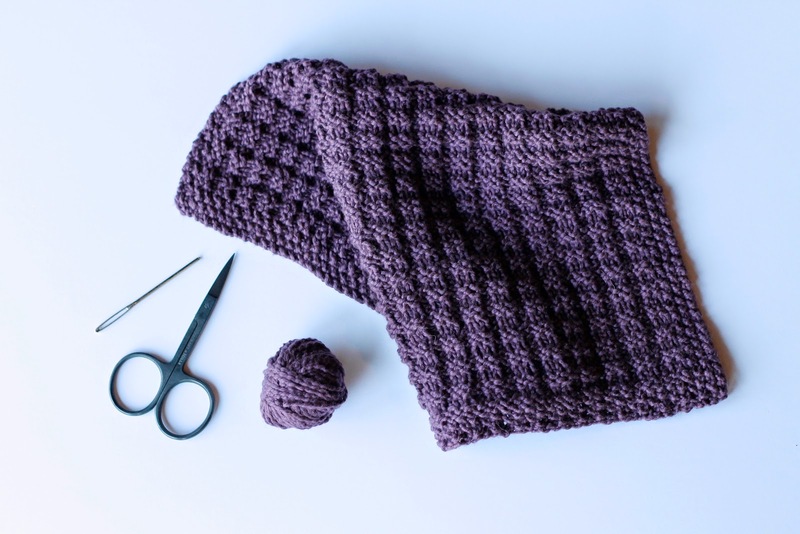 For this project I used one skein of Seedling and size US 6 needles. 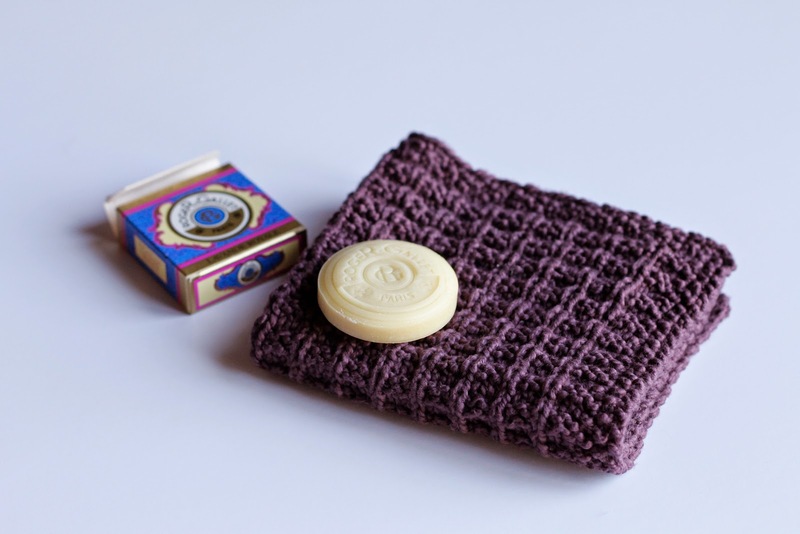 I follow the pattern for Spa Day Facecloth by Anne Mancine. 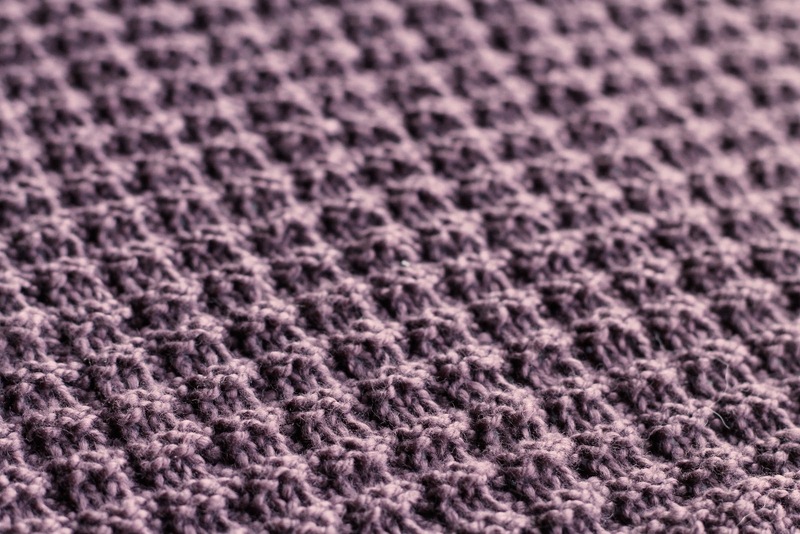 If you are not familiar with the seed stitch, here used for the border, just alternate K1, P1 and repeat to the end. On the next row, knit the purls and purl the knits, which here will mean simply repeat K1, P1 to the end. I found her suggestion to use stitch markers on each side of the border helpful, as I often get caught in the repetitive pattern and forget to change to the border stitch at the end of the row. Once I was done with the facecloth, I had this silly little ball left over, a mere 9 ounces of yarn. 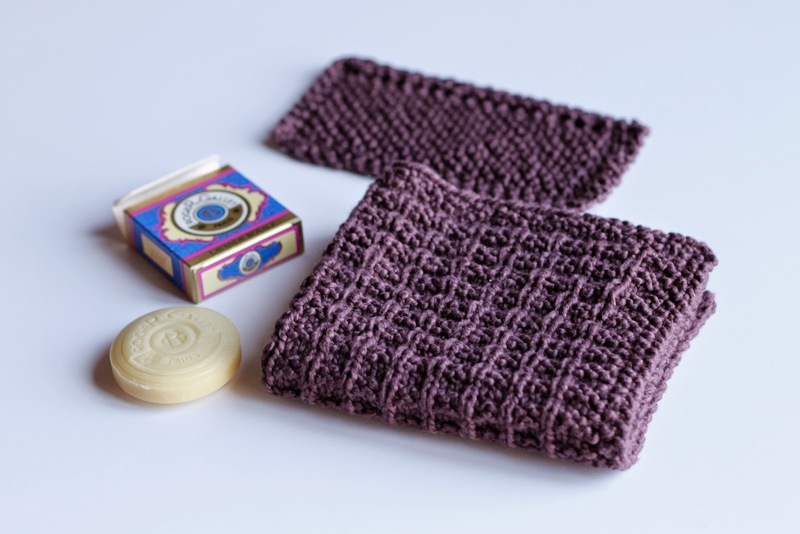 I didn't want to put it back in my stash, and it seemed like too much to simply waste, so I decided to make a little dishcloth, perfect for washing the dishes, following the classic granny washcloth, which you can find here. I used size US 7 needles, and it was the fastest project I ever made. 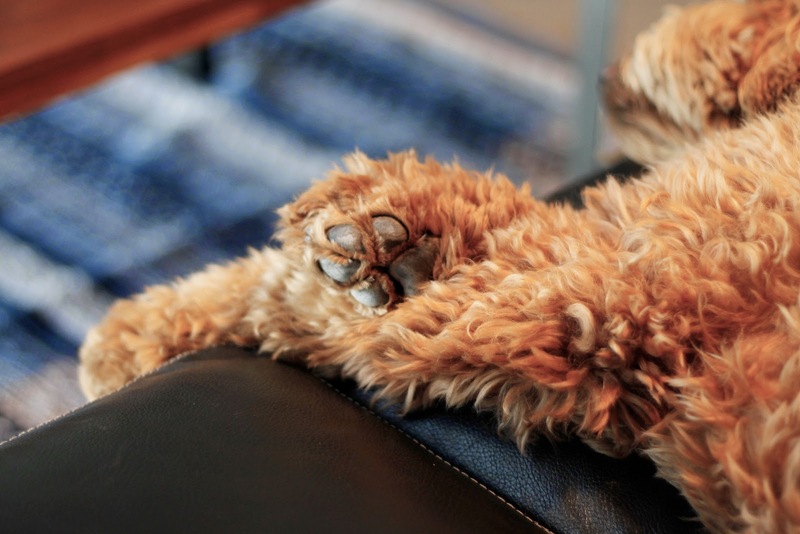 I had to tip-toe in the kitchen to try it out, silently washing the dishes, to avoid awaking the little bear on the couch.